Although the cocoa tree blossoms and produces all year round, the harvest times are usually in March and October. The pod reaches the required degree of ripeness 5-6 months after pollination. Its harvesting demands painstaking manual labour: a long pole with a special knife on the end is used. 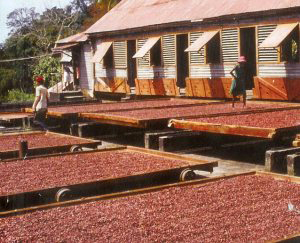 Fermentation is a natural process commencing spontaneously in tropical climates, during which the sugary fruit pulp separates from the cocoa beans. The picked fruit is first seeded, and then the ripening takes place on banana leaves or in boxes, as the various chemical processes ensue, the fruit pulp disappears, and the colour of the beans takes on a nice dark brown. The fermentation period varies by strain and lasts 2-8 days. The aromatic agents generated during fermentation are a precursor to the later cocoa aroma, which will form permanently during roasting. The fermented bean processed in this manner is called a COCOA BEAN. 3. DRYING – The final operation performed on the cocoa plantation, in order to reduce the cocoa bean’s high water content. As a result of drying them in the sun, the moisture content is reduced from 50% to 5-7%. Here too, manual labour is all-important: the seeds must be moved and rotated continuously in order for the sun to ripen them evenly. Chocolate factories store the cocoa beans in enormous, climate-controlled warehouses. It is important to maintain a supply, since this can protect against fluctuations in world market prices and changing production yields. During cleaning, the raw cocoa is cleaned and sifted using high-powered vacuum air currents. After cleaning, the fat and water contents of the cocoa beans are determined with laboratory tests. The secret of every chocolate’s quality is in the roasting! First, the water content of the cocoa bean is reduced to 3%, at which point the shell only loosely clings to the bean. Afterwards, the aromas are released: the beans are heated to a temperature of 120-130 Celsius. This is when they also take on their final chocolate colouring. The cocoa beans, after being cooled, are placed in the cracking machine, where the now-loosened shell is cracked by large rollers, and then the bits of shell are blown away by a powerful air current. The shells are not utilised in the chocolate industry; however, because of their high theobromine content, they are an important base material in the chemical sector. Afterwards, the cracked beans are separated into cocoa butter and cocoa powder: grinding in the cocoa mills releases the fat in the cocoa bean, and cocoa butter is formed. The rollers in the grinding machine crush the chocolate to a fine consistency. A refining procedure, during which the chocolate, through constant kneading and mixing, melts in the resulting heat and changes into liquid plain chocolate. Its softness, lustre and crunchiness develop as a result of heating and cooling.